Shamanism teaches that illness must be treated from a spiritual as well as a physical perspective. Shamanic healing deals with the spiritual component of illness. A shamanic practitioner works by entering an altered state of consciousness, similar to a dream state, in order to work with compassionate helping spirits for the benefit of the client. These helping spirits appear to the shaman in journeys, dreams, and other initiatory experiences. As long as the shaman is working compassionately and for the benefit of others, their helping spirits continue to assist them by providing information and power. Most shamanic healing work is done through the technique of “journeying.” The journey is the shaman’s method of shifting consciousness to cross into non-ordinary reality. This is usually accomplished with the help of drumming or rattling. While in a shamanic state of consciousness the shaman can access helping spirits who then direct the healing activity or give information about what the client needs. In my own healing practice I do shamanic journeys for clients for the purpose of soul retrieval, power animal retrieval, divination, extraction of negative energies, and for information that will help in their healing or life path. I also teach the techniques of core shamanism in weekend workshops for the Foundation for Shamanic Studies, and in private sessions at my Santa Cruz office (see shamanic counseling.) Check the homepage of this site for listings of current workshops offered in the Santa Cruz area. 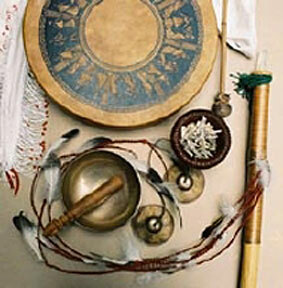 Shamanic Healing sessions are offered by appointment. Contact me for scheduling.